“Life is a journey, with unexpected twists and turns”, began the friend and I retched inwardly. It is such a cliché, stale but so dully true. It would also sum up my latest trip to the Himalayas. To stretch the metaphor, what is more important in the journey of life or that to the Himalayas, is the company you keep, the route you take and how you travel through. 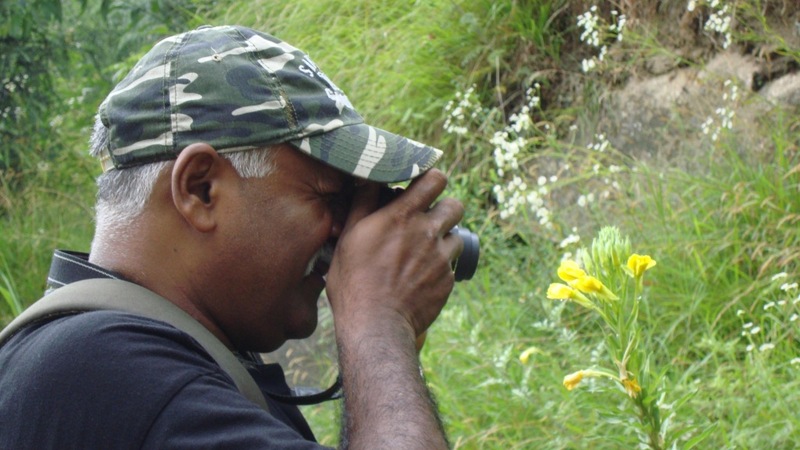 My wanderings in the Himalayas began more than 25 years ago; I visited its different regions regularly, mostly alone, with family, then with a friend or two or organized treks and bike rides. I still prefer to do it alone; though I wouldn’t really say so about my life – the happiness I owe to my family and friends and the society at large is much more – or different- than I would’ve got, if I were alone. From Jalori Pass deep in Himachal Pradesh, there is a short trek of 6km to a little lake and a temple. We walked through the pine forests in incessant rains and thick mist. Signs and inspiring words pointed to the destination. I come across one – ‘ Better alone than with bad company’. But I had great company. Dr KVS and Satheesh , friends since 23 years, Gopi, fellow biker, mountaineer, professional wildlife photographer and Ananthu, Satheesh’s 15-year old son. What we had in common was love for nature and a passion for Himalayas. Even Ananthu was on his second trip to the snows. Our destination was Leh, in Ladakh. I had been to Leh twice before, on foot and on bike – this trip was to be in a car- I wasn’t keen on the mode of transport but again, for the sake of my friends I curbed my desire to bike it through. The Volvo bus, which left ISBT New Delhi at 1930, stopped at one of the innumerable roadside dhabas near Sundernagar in the early morning. We tore into our Aalu Ps that shimmered in the sheen of slowly melting Amul butter chunks. Chena Masala, a double-egged omelet, Dahi (curds) and a pickle with unidentifiable pieces of vegetables embellished the breakfast that had us running to the loo in no time. Reaching Manali in the afternoon, we stayed in a guesthouse in Old Manali that belonged to a friend of Gopi. (To those who haven’t been to Manali – there are two Manalis, the town frequented by Indian tourists and the village by foreigners. Manali is a typical touristy hill town – which to choose depends on your tastes and interests.) The next day we spent walking to Solang valley about 13 km away. Manali at 1950mt is ideal for acclimatization if you are going to higher altitudes. 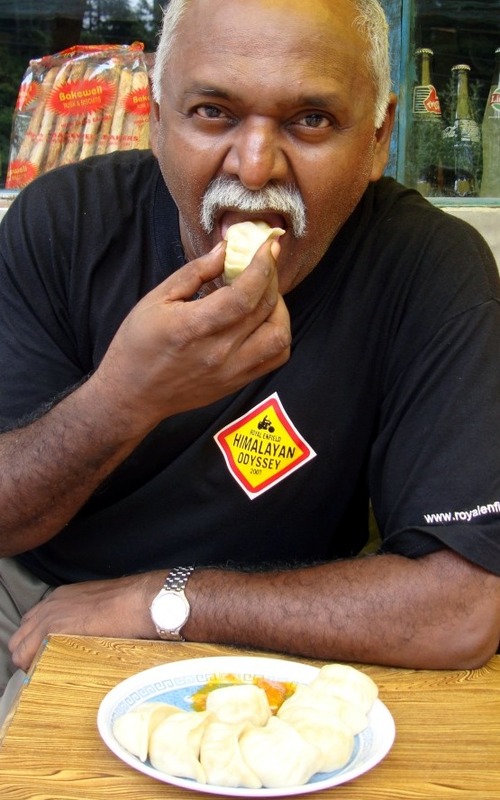 A few kilometers into the trek, Dr KVS declares he has had enough. The path is quiet and beautiful. To our right flowed the Beas, rushing down to Manali from the high mountains. We are a mixed lot, physique-wise. Anathu, youngest at 15, is a lanky, athletic fellow, who skims over ascents as rapidly as he fires questions to every answer he seeks. Gopi, 36, bachelor, certified mountaineer, trekker, solo biker, photographer, French linguist from Pondicherry, keeps generally to himself as he ascends the hills as if on an evening stroll in his seaside town; except of course, in the evenings he goes garrulous about Latin America and Eduardo Galeano, aided by the warmth in the belly. Satheesh, 45, heading one of the largest NGOs in the country is 100 plus, though he claims he was a champion sportsman in his younger days. Doc and I in our mid 50s are the stragglers. I am more experienced in Himalayas than my friend – the advantage is in knowing what to expect and how far one may go. Mountains make you aware, not only of the mind, but the body too. Ever since I ate my first steamed Chicken Momo somewhere deep in Sikkim in 1988, I have been a devotee of Tibetan cuisine. Like the land and its people, Tibetan food too is simple, bare but nourishing. Be it the Momo or their music, one is transported to the vast, seamless horizons, the bare brown mountains with snow-capped peaks. The bright red chill chutney that comes with Momo – I bite off an end of the Momo and carefully stuff its cavity with the chutney to the brim, pause – and with a yearning, anticipating yet another moment of bliss, carry the Momo gently into the cavity of my mouth – tongue catches fire – messages of extreme pleasure are sent to and fro between the brain and the sensitives nerve-ends in my mouth. Fulfilment as my teeth meet the meat and grinds it gently, with great relish. In that little tea-shop in Old Manali, we are served plate after plate of steamed vegetable Momo. 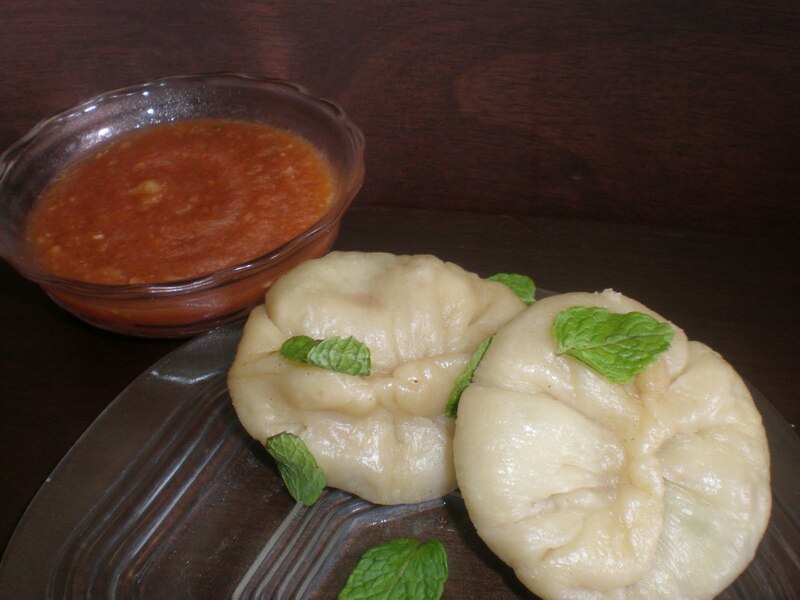 These are excellent, succulent, home-made Momos, so easy on my stomach – one forgets the number of Momos consumed. I share mine with a street dog. 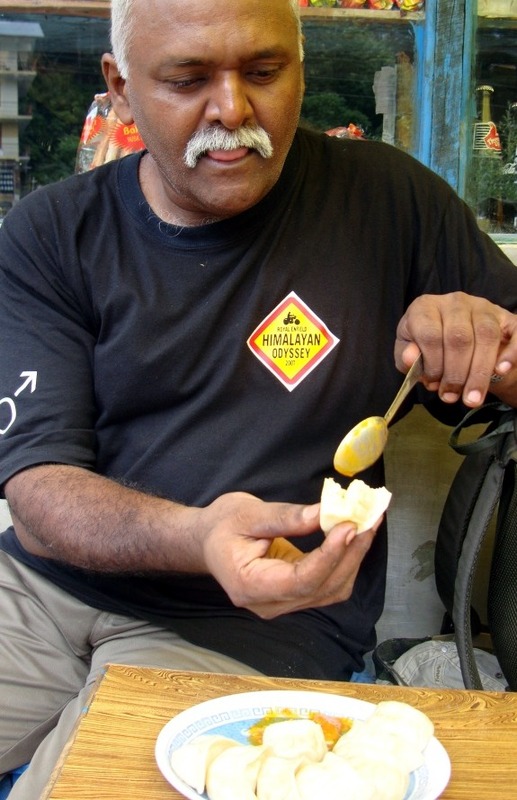 We eat, belch, wait and eat again as Ananthu goes rappelling across the stream. Mid-stream, the operator swings the rope and Ananathu is buoyed till he skims the surface of the gurgling stream. We wait for the next day when we would ascend Rohtang Pass, and across to Lahaul valley and Leh. You are wicked - doubly wicked. 1. You start your much anticipated travelogue to heaven (Himalayas) which sure would make us jealous. 2. Next, you garnish the travelogue with yummy food. @B: I won't surprise you. We never reached Leh. Landslides at Rohtang Pass saw to it. Tried to cross a couple of times, 'fuzzz ho gaya'. We lost precious days in the traffic jam, but got away with our lives. Even the latest Himachal News says that the road up is closed for traffic! :-( So what else but the Aalu P and Momo and Thupka! The morning view from your guest house is breathtaking.So many times i have wished in my heart to go on long trips to Himalayas .I remember my trip to Pindari Glacier vividly .Now we customize our travels keeping the comfort of our kids in mind.Waiting for the next part . 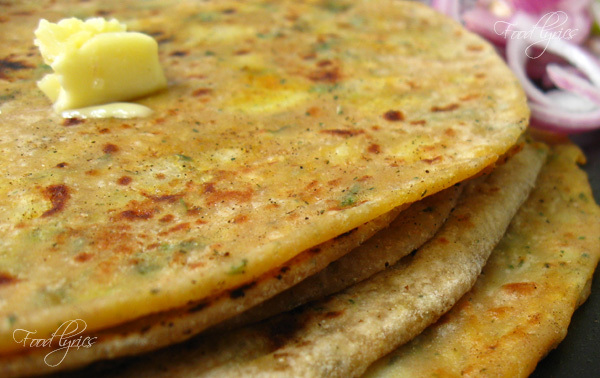 BTWI know what i am cooking tonight for dinner -- aalu paratha it is and with lots of butter. Dey, the opening picture is wonderful. So are the descriptions of the gourmets delights. What you said about , rather travel alone than in a company that puts you off, has been oft repeated by you. And true indeed! You surely must have missed Mr Narcissus. And he I'm certain envious if he reads your piece. Even I’m a traveler, an arm chair traveler. The difference is you go to Himalayas, I read the accounts by those who braved to venture into the terrain. The first book I read about a Himalayan journey was by Rajan Kakkanadan titled ‘Himavante Mukalthattil’. Till date I might’ve read a lot of them. One thing I noticed is that there are two types of narrations. One places too much importance to the spiritual aspect, others though subtly spiritual place more prominence on narrating the landscape. I prefer the latter and yours falls into this category. “We walked through the pine forests in incessant rains and thick mist.” I can see it.